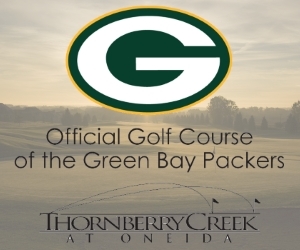 Thornberry Creek at Oneida is a 27-hole golf operation with an 18-hole championship course and a 9-hole executive course designed by Rick Jacobsen. The 9-hole course featuring double flags / double greens is a unique way to get a quick 9 in or set up a true 18 hole experience. The 18 hole Legends golf course hosted the 2017 Thornberry Creek LPGA Classic, now a regular stop for the LPGA tour with an initial agreement through 2019. In preparation for the LPGA, Thornberry went through a $2.7m renovation including a complete redesign of the practice facility adding 40,000 sqft of tee space, a brand new putting green and a full short game area with a bunker. While playable for golfers of all levels, the Legends Championship Course can challenge the most proficient players, with more than 70 sand bunkers and 11 water hazards placed strategically throughout its 18 holes. There are 4 sets of tees ranging from 5,103 to 6,934 yards. View the layout below. During your round on the Legends Course, make sure to stop by Leinie's Lodge, located after #6 and #15, for the best on-course grilled brats and burgers, and cold refreshments. Our Original Iroquois 9-Hole Course is distinguished as one of only ten official PGA Family Courses in the state of Wisconsin. This par 36 golf course offers 4 sets of tees, as well as Level 1 (1,100 yards) and Level 2 (1,800 yards) tee boxes for the kids, and two greens for each hole. This course is fantastic not only for family play, but also for weekly recreational play, league play, and golf outings. After your round, check out our spacious and comfortable Sports Pub & Grill, where you can enjoy some great food and cold refreshments, while watching the day's games and sports news on one of our 24 LCD HD TVs. If you prefer to dine "al fresco" in the warmer months, our lovely outside deck overlooks the golf course and offers a beautiful view of Green Bay. In addition to the extraordinary golf and dining experience, our well-appointed banquet facilities and meeting rooms are available for your groups from three to 300 people, all year long. Thornberry Creek's professional staff and elegant room settings will ensure that your business meeting, bridge group, birthday party, wedding reception, golf outing, or holiday party is a successful and wonderful experience. Visit our website www.golfthornberry.com for specials and off-season pricing. Just 10 minutes from Lambeau Field! Located on the west side of Green Bay, approximately 2.5 miles on Highway 29 West to County FF. Turn left over bridge and then right on Centennial Centre Blvd. Then turn left on N. Pine Tree Road. General public may book one week in advance. Larger groups are encouraged to call the golf shop for advanced booking at 920 434 7501 x 1. * Unlimited Golf, Carts & Practice Range Use! Your Golf Outing Headquarters! We host the most golf outings in the area! Over 50 years of golf outing experience on staff to make sure your event runs smooth and is the most successfule it can be! Ask us how we can donate back to your cause! Finding someone to trust and grow old with should be the hard part. Thornberry Creek at Oneida prides itself on making the day you say "I Do!" the easy part. Our ballroom is the ideal venue to host your wedding with accommodations to up to 300 guests. Our experienced staff is ready to work with you on your once-in-a-lifetime event to create a lasting impression and memories that will last a lifetime. Set atop one of the highest peaks in Brown County the clubhouse offers breathtaking views that will impress your guests during any season and the natural beauty outside is the perfect accent to your special day. Our cupola room serves as not only a beautiful entrance to the ballroom, but also an elegant venue for your wedding ceremony. The cupola room can accommodate up to 120 of your closest family and friends to experience the exchanging of your vows. The Sports Pub offers guests a comfortable and inviting atmosphere, serving exceptional meals any time of year. Whether hosting a holiday gathering or kicking back with friends after an adventurous day on the links, The Pub delivers first rate service and fresh cuisine seldom found in the Green Bay market. With Green Bay's first true wood fired pizza oven, and a menu developed to offer great variety and value, it's obvious why our guests keep coming back. And with such incredible quality produce, meat, and cheese available from Wisconsin, it was a no-brainer to source whatever we could from as close to home as possible. From our premium, fresh, never frozen, locally sourced beef, to a variety of cheeses that come from right in our neck of the woods, if you want local, we have it! In addition to our fantastic food, The Pub features 20 different draft beers and ciders, focused on the locally growing craft beer scene. In fact, 13 of our 20 offerings are sourced from right here in Wisconsin. And on those hot summer days, know that we keep the beer at a cool 33 degrees to quench your thirst after a great round. Lucky enough to visit us on a Friday? You'll find the area's best fish fry, with locally sourced Lake Perch and Walleye that our guests can't get enough of. Watch the Iroquois 9 Hole Course At Thornberry Creek At Oneida Video. 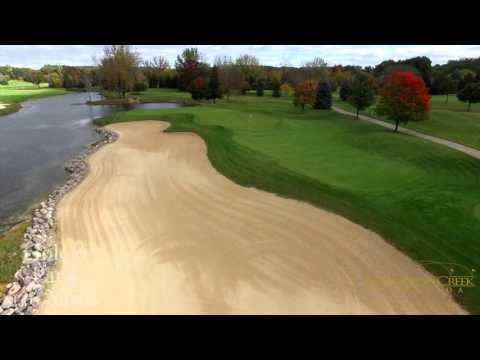 Watch the Thornberry Creek Golf Course Flyover Video. This profile was last updated on 01/17/2019 and has been viewed 53,358 times.